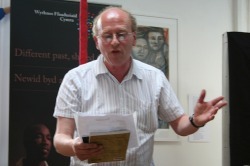 Mike Jenkins is an award-winning Welsh poet and author. Mike frequently appears on radio and television and is known among Cardiff City football fans as the club's 'unofficial poet'. Follow Mike on facebook to keep up with his latest readings and publications. To purchase Mike's novella for teeangers, The Climbing Tree, visit Pont now. Mike's novella, The Fugitive Three, is also available to purchase from book shops or from the Cinammon Press website. Mike previously judged The Welsh Poetry Competition and encourages you to read the winning entries HERE.